Now that we have seen it, what is remarkable about the legal advice to the government on the withdrawal agreement is how unremarkable it is. Readers of this blog are far from being the only ones who would have found the advice telling them very little that they didn't know already, especially in terms of the headline issue – the possibility that the customs union could become a permanent feature of the agreement, rather than the temporary arrangement that the government insists it will be. We also have confirmed to us that there is no unilateral mechanism for extracting ourselves from the UK-wide customs agreement in the event that we are unable to reach a subsequent agreement. This remains the case even if the parties are still negotiating many years later, and even if the parties believe the talks have clearly broken down and there is no prospect of a future relationship agreement. 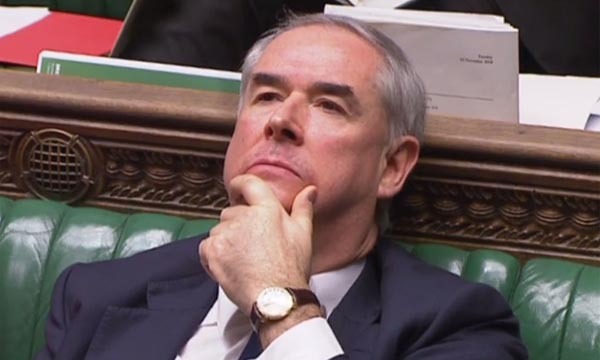 In a helpful addendum though, we find Geoffrey Cox (pictured), the author of the advice, warning that the resolution of such a stalemate would have to be "political". This, from the government's own lawyer, is a clear shot across the bows of the noisy claque of lawyers who have sought to "own" the Brexit debate and exclude those whom they regard as lesser mortals from it. That does at least remind us of an unalterable truth about treaties. Although they are clothed in the word of the law, and the courts are increasingly involved in their administration and interpretation, they remain essentially political instruments – made by politicians and, in the final analysis, to be disposed of by politicians. With so little new to add, though, it is entertaining to read the "take" of the Irish Times. Sharing almost exactly my view, journalist Cliff Taylor decides that, from the Irish viewpoint, the conclusions of the legal advice are merely "a statement of the obvious". It is only in the hothouse atmosphere of Westminster they are being treated as "incendiary", although the indignant surprise is largely feigned. Even our MPs cannot be so lacking in political intelligence that they weren't already fully well aware of what the legal advice might say. That, of course, leaves the only unknown of any consequence – what the MPs are going to do when they come to vote on the package next Tuesday. But here, there are so many permutations that even many MPs probably don't know which lobby they are going to walk through. One interesting facet of this whole affair is that the general public seem to be more sympathetic to Mrs May's plight (even if it was self-induced) than are the majority of MPs. That could well affect sentiment, after MPs return from their constituencies over the weekend, having sounded out local opinion. However, despite issues of monumental importance being at stake, with massive long-term consequences for our nation, the bubble, rather typically, is more concerned with the short-term career prospects of the prime minister. Amongst that, we get Nick Timothy, one of the people least qualified to comment on events, pontificating that, as a result of Dominic Grieve's amendment, "a no-deal Brexit will almost certainly be stopped". This same lacuna graced the front page of The Times yesterday (print edition). A significant number of politicians and journalists apparently believe that parliament, by way of an amendment to the government motion, can instruct Mrs May to reopen negotiations with Brussels, thereby preventing a "no deal" scenario taking effect. One really does wonder what it will take to eliminate this mistaken belief from the system. But when the government cannot force the EU to come back to the negotiating table, and where "no deal" is the default option in the event that the withdrawal agreement is not ratified by parliament, it is a matter of astonishment that supposedly sophisticated political actors can get it so wrong. Since Nick Timothy was Mrs May's trusted adviser at the time of her Lancaster House speech, it is hardly surprising that she sought to remove the UK from the Single Market without understanding the implications of what she had done, or even clearly realising that this is what she had done. And now this feeble little man asserts that, if the Government loses next Tuesday's vote, we will be left with two likely options: the Norway model, or a second referendum. It is not possible to be sure precisely what Timothy means by "Norway model" – probably, he has only a vague idea himself. But, if there are any guarantees in this world, one we can rely on is the simple premise that this will not be going to Brussels any time soon. And nor indeed is it at all likely that we will be seeing a referendum launched as a response to a parliamentary rejection of the withdrawal agreement. The procedure that must be followed is set out in the European Union (Withdrawal) Act 2018 – Section 13 refers. Within 21 sitting days of the agreement being rejected, a minister must make a statement to the House and then, no longer than seven sitting days afterwards, the government must table a motion to the effect that the House has "considered the matter" of the statement. It is this that can now be amended and possible amendments that are being touted are the demand that the government either go to Brussels with this fabled "Norway model", or that a referendum is launched – although on what has not been specified. One presumes that the People's Vote activists will want to put the May plan to the test. But if neither of these is a practical proposition, the alternative is that the House either accepts or rejects the motion. Where the former takes us is too early to say, but the latter could lead down the path to a vote of confidence. Again, the outcome of this is hard to call. Yet another permutation is creeping onto the agenda though, as we see news that "cabinet ministers" are urging Theresa May to delay Tuesday's vote, for fear that a defeat could be so catastrophic that it could bring down the government. Some MPs, on the other hand, are still harbouring the illusion that they will get the vote, whence they can vote it down in order to send Mrs May back to Brussels to renegotiate the "backstop". That could possibly be another outcome of the government's motion on the statement, although it is yet another which does not lie within the realms of practical politics. What all this amounts to, therefore, is that no one has any real idea what might happen over the next week or so. However, there is a fixed point looming in Mrs May's diary – the European Council on 13-14 December. The prime minister will be expected to give her fellow European leaders some indication of progress. If she arrives empty-handed, it is likely that she will not be greeted with the greatest of enthusiasm. But overshadowing the thinking of the "ultras" is the spectre of Brexit being abandoned altogether. Mrs May so far has been consistent in her determination to see Brexit through and, even if the ECJ does formally allow unilateral revocation of the Article 50 notification, she says she has no intention of exercising that option. However, the continuity remainers have been nothing if not inventive in launching road blocks to the Brexit process. Stopping Brexit is not being ruled out altogether, the fear of which could drive some Tory rebels to support Mrs May's plan. Yet, in her increasingly desperate efforts to garner support, Mrs May isn't doing herself any favours. Her latest ploy is to promise a "parliamentary lock" – giving MPs a vote before the backstop could be implemented. If a proposal to introduce unicorn farming would be more credible, it says something of the Brexit process now that the collective fantasies of the political classes are now driving the agenda. And where we go from there is very far from bleedin' obvious.